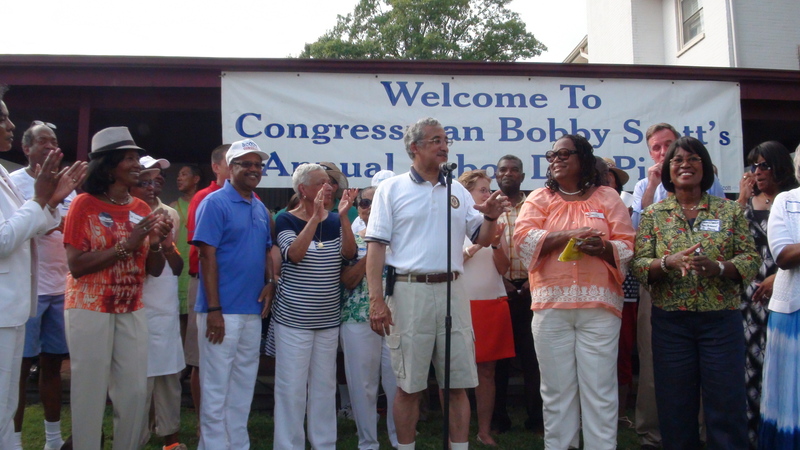 Rep. Bobby Scott held his 38th Annual Labor Day Picnic Monday. After a pleasant summer, Monday was really, really hot! Nonetheless, hundreds gathered on the Newport News waterfront to mingle and hear from Senator Mark Warner. The group of electeds, former electeds and candidates in attendance seems to grow every year. It’s been a while since I posted video of Scott’s introductions, so here it is. Of course, the reason the media was hanging out when I arrived was to get a glimpse of Warner. Although it was his fourth event of the day, Warner didn’t disappoint. And he keep his remarks short – which I appreciated considering the temperature! LG Ralph Northam introduced Warner. To those who didn’t make this year’s event, put it on your calendar for next year. If it’s Labor Day, it’s time for Rep. Scott’s picnic.